When Mia moves next door and into Jack's life, they become the best of friends. They do everything together. They even get sick together. But then Mia's family moves far away, leaving Jack forlorn and lonely. It's a familiar enough scenario, right? But this is a tale of friendship with a modern twist and, through the power of technology, Jack and Mia find a way to continue their friendship. This internet-driven method of communication allows the friends to laugh and play and imagine, just as before. Robert Vescio has written an endearing story of friendship, imagination and change. Through poignant and fluid language, he captures the warmth and beauty of Jack and Mia's friendship, complete with dress-ups, family concerts and richly imaginative games. 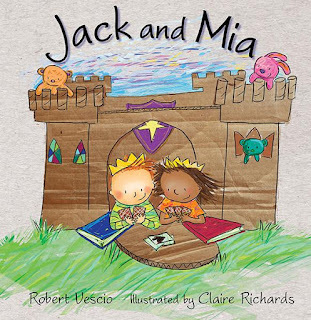 The illustrations convey a child-like simplicity with bright colours and gentle lines to mirror the innocence and charm of Jack and Mia's world. This is a beautiful book to share with children who have been separated from a loved one or friend, and a lovely way to discuss the importance of working to maintain those special bonds.